World Lemur Day 2018 – Things we love about lemurs! When anyone starts talking about lemurs, people will almost always think of the well-known ‘ring-tailed’ lemurs that Madagascar is most famous for. Who doesn’t love the cute and fluffy, wide-eyed creatures that can seem almost human in some of their behaviours?! But these ring-tailed lemurs, along with the 100 other subspecies of lemur native to Madagascar, are considered to be the most threatened mammal group on Earth, affected by deforestation and subsistence hunting. To celebrate World Lemur Day and these enigmatic primates, we’ve put together our favourite interesting facts about them! They share this group with bushbabies, lorises and pottos and branched off from other primates about 60 million years ago. Today, lemurs have a diverse population, with different species ranging from the tiny mouse lemur at just 9cm, to the indri lemur which is the same size as a small child at nearly 70cm, all with a variety of different markings and in different colours! The name lemur comes from the Latin word lemures which means ‘spirits of the night’. Whilst this may simply be because many subspecies of lemurs are nocturnal, in Malagasy culture, there also seems to be a connection to the idea of lemurs as spirits. If you’re planning a visit to Madagascar, or have been before then you will most likely have heard of ‘fadys’ – a Malagasy word which roughly translates as taboo, or as something sacred. Fadys affect all walks of life for Malagasy people and are taken seriously, having a knock on affect to the environment too. 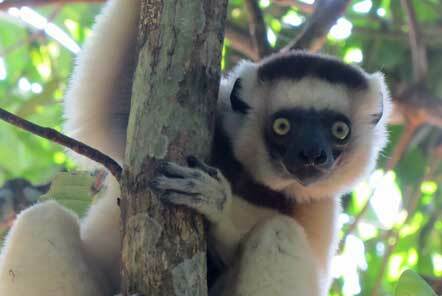 They vary from village to village and there are several fadys relating to lemurs! Not a fad, a fady! One old legend tells that the spirits of the ancestors of Malagasy people live on in the Indri (also known as ‘Babakoto’, or ‘the ancestor of man’) – a tradition that helps protect this critically endangered lemur, as the locals revere it and consider hunting indri a serious taboo. At the other end of the spectrum, a fady relating to the endangered aye-ayes means that the sight of one of these rarely seen and unusual animals fills Malagasy people with fear. It is believed that if an aye-aye points it’s long spindly finger at you, you will soon meet ill-fortune such as sickness, or even death. Therefore, the most common response to seeing an aye-aye is to kill it – accelerating their already declining numbers and meaning that conservationists have to work twice as hard to protect these lemurs. Who runs the (lemur) world? Girls! This female dominance is somewhat of a puzzle though as ‘lady lemurs’ have no physical advantage over their male counterparts! Scientists have known for a long time that primates are able to learn new skills by observing the peers in their group. You might be surprised to learn then, that a new study has shown that the flip side is also true and lemurs value innovation - a lemur with a new skill becomes more popular the more they practice it! Primates show affection towards each other through behaviours such as grooming, touching and sitting close to each other. This kind of social behaviour is usually reciprocal, but in the study, lemurs who were seen by their peers to be repeatedly demonstrating innovative behaviour (in this instance problem solving to retrieve a grape from within a Plexiglas box), then also received more social attention. The creative lemurs received lots more grooming, without providing more grooming to others – So as a lemur, the smarter you are, the more friends you have! As the only primates that can hibernate for an extended period of time, lemurs also have a thing or two to teach us about sleeping! The fat-tailed dwarf lemur can go for up to seven months in hibernation, lowering their heart rate from 180 to just 4 beats a minute and taking a breath just once every 10-15 minutes. Not only is this unique in primates, but due to the genetic similarities between lemurs and humans, it's possible that they may be able to teach us how to hibernate too! The implications of this could open up new possibilities in space travel and medicine to humans - such as hibernating someone that's in need of an organ transplant until it becomes available, potentially saving lives!